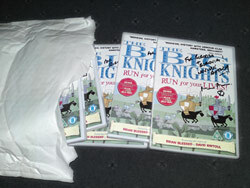 Buy The Big Knights DVD/Blu-Ray out now! The Big Knights Feature Film – “The Big Picture” – is on its way. Of all our characters, Boris, Morris, Horace and Doris are clamoring the most to be allowed onto the big screen. So we’ve decided that it should happen. Scriptwriting is underway, technical tests have started. We’re going back to Borovia. Watch this space for more news soon! Thanks to everyone who entered and please keep visiting the site for more exclusives in the future. If your name is listed here and you have not received your confirmation email, get in touch ASAP! This is it, RELEASE DAY! Hopefully you’ve received your copy(ies) and you’re smiling as hard as we are! If you haven’t ordered yet – ORDER NOW! We’ve come a long way and now the day has arrived for you to get hold of a copy of every Big Knights episode made (so far) and not only in DVD quality but in HD Blu-Ray too! I’d just like to take this opportunity to thank everyone who has got behind this campaign and proved that there is a big fan-base who were just waiting to snap up a re-release. Huge thanks to AstleyBakerDavies for making this excellent program and getting all the episodes remastered and released. And now for stage 2, please don’t stop visiting this site, we’re already lining up the next stage of The Big Knights plan and we have a few more interesting things that we will be releasing over the coming months. If you haven’t entered the competition yet, head over and do it now.